A media event was held Friday morning at Metro’s Division 13 facility to promote cap-and-trade efforts in the state and the regional benefits of reducing greenhouse gases and raising money for transit and other clean energy programs. Supervisor Mark Ridley-Thomas is at the podium in the above photo. 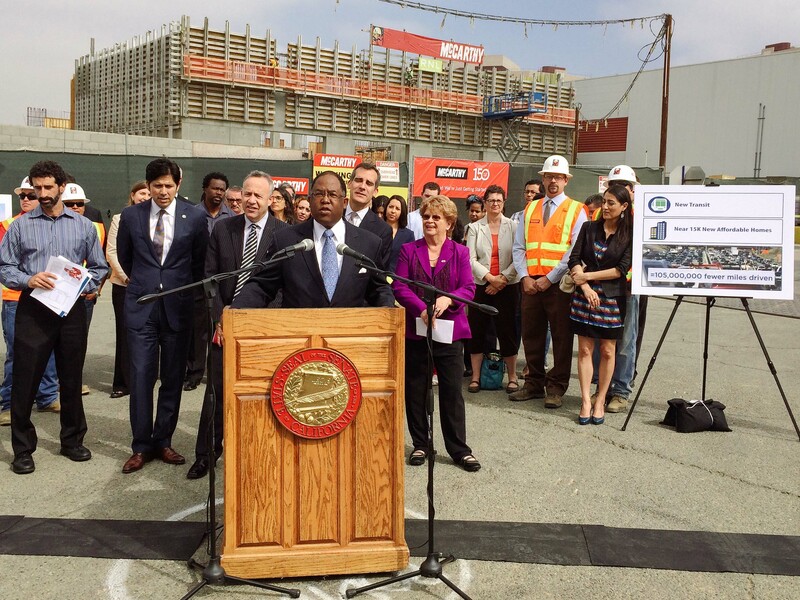 Behind him, from left, are Senator Kevin de Leon, Senate President pro Tempore Darrell Steinberg, Los Angeles Mayor Eric Garcetti and Metro Board Chair Diane DuBois. Photo by Luis Inzunza/Metro. The Kern County Board of Supervisors voted 4 to 1 to file a state lawsuit alleging the environmental impact report for the bullet train project did not adequately study the impacts and mitigations on the route between Fresno and Bakersfield. The city of Bakersfield is also planning to file a similar suit. The city has taken issue with the proposed route through town for the train, alleging it’s too disruptive to existing buildings and roads. The county is also one of the plaintiffs in an ongoing suit alleging the project is not properly using voter-approved state bond money. Officials in the San Gabriel Valley want a planned segment of the Gold Line from Azusa to Montclair to be included in the short-range plan to be considered by the Metro Board this summer. The only transit projects listed in the plan — which covers the next decade — are those that have funding from Measure R. Of course, what gets built over the next decade or so could change, depending on whether the Metro Board seeks a ballot measure in 2016 to accelerate and/or build more transit projects. The new mall — to be called The Platform — is across the street from the Culver City station on the site of old auto dealerships. One of the new tenants is Blue Bottle Coffee for you coffee nerds out there. Nice to finally see some development in Culver City near the train station. There has been a lot of talk but not much action in recent times. The opening game is June 12 in Sao Paulo, perhaps the reason that transit workers in Sao Paulo went on strike Thursday. Naturally, the easiest and best way for fans to reach the game is by train. Not all workers left the job — but enough did to cripple the system, despite a judge’s orders not to strike. In related news, if you have HBO watch the segment on Real Sports about countries that build stadiums for the World Cup and Olympics and what happens to those facilities after. Short answer: white elephants. Have fun at tomorrow afternoon’s game, Kings fans. Staples Center is easily reachable via the Pico Station shared by the Blue Line and Expo Line. As for the above photo…it’s nice to see the Rangers making a beer league mistake, leaving Kings winger Justin Forward alone in the high slot — the exact place from which you never want the other team shooting on your goal. And if Neel Kashkari wins the gubernatorial race (fat chance), he’ll kill off the HSR project. Kashkari only favors government indebtedness if its corporate welfare (e.g. TARP his baby).